After Great Success of Moto Z2 play now the sources coming out for the upcoming flagship phone, expected to be called Motorola Moto Z2 and Motorola Moto Z2 Force. According to Evan Blass, the source provider of the phone has revel The Moto Z2 Force will be available on at least one other carrier in the US. Evan Blass tweeted a full press render of the upcoming flagship of Moto Z2 force with the complete description. Looking at the image, you can spot the AT&T logo placed just above the Moto Mods accessories connector. 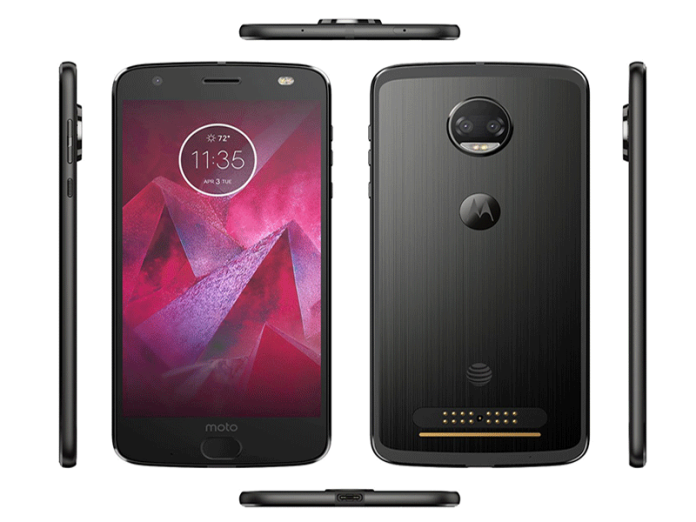 So naturally, it should be the AT&T edition of Moto Z2 Force. Earlier reports have stated that the smartphone would be available through other operators as well. According to source the design of phone looks quite awesome with sleek body, the rear panel of alleged Motorola Moto Z2 Force holds slightly protruded dual camera setup and having flashlight below the camera and the sensors are placed in a circular area, we can also see that the Moto Z2 Force’s home button is more rounded than the square one found on last year’s model. According to some other resources, the Phone is coming with a 5.50-inch touchscreen display with a resolution of 1440 pixels by 2560 pixels. The Motorola Moto Z2 Force is rumored to run Android 7.1 and be powered by a 2700mAh non-removable battery. It is said to measure 155.80 x 76.00 x 5.99 (height x width x thickness) and weigh 143.00 grams. The Motorola Moto Z2 Force tipped to be a single SIM (GSM). Connectivity options are said to include Wi-Fi, GPS, Bluetooth, NFC, 3G, and 4G. Sensors on the phone are rumored to include Compass Magnetometer, Proximity sensor, Accelerometer, Ambient light sensor and Gyroscope. Let’s wait and watch and stay tune about the launching that of the flagship and please give me your suggestion below in comment box.